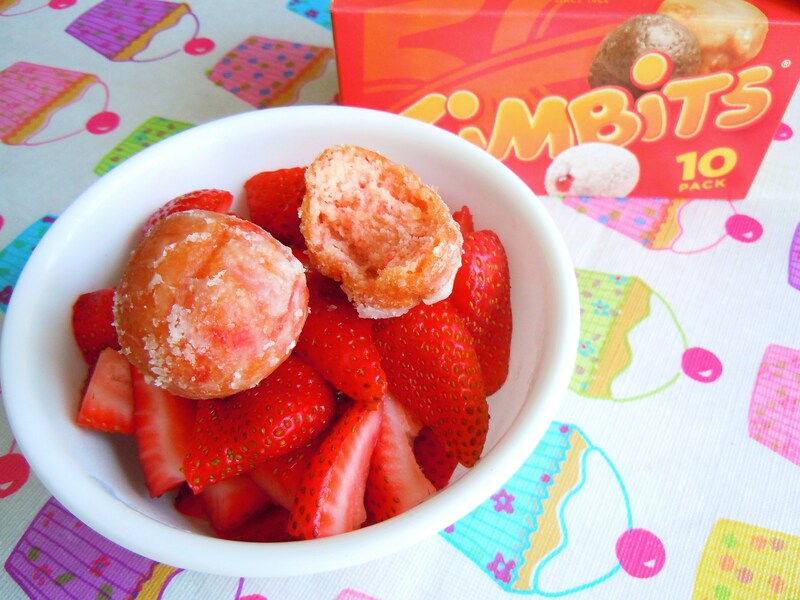 IT’S TIMBIT TIME! Has everyone tried the new strawberry and birthday cake sweets yet?! I don’t know about all of you, but I looooove when Tim Hortons comes out with new Timbit flavours and I looooove when I stumble across flavours that I can’t get at every location, like the cherry ones (which I always see at the Dufferin Mall location along with a few other spots) and the Boston cream ones (which, sadly, I have no idea where to get now since I used to be able to get them at the Tim Hortons inside the Sears at Eaton Centre which is now, you know, no longer there). So yes, I love me my Timbits and my new flavours and since we’re on the topic, my favourite is the sour cream glazed, my least favourite is the chocolate, and I’m dying for them to come out with some delicious coconut concoction! 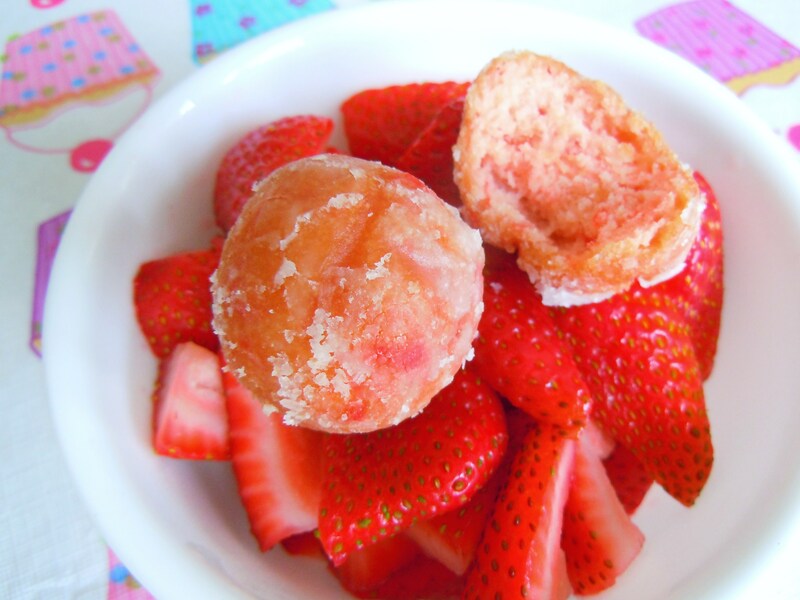 Now I know the new limited time line of strawberry pastries and donuts is being promoted and offered pretty much everywhere this summer, but that certainly doesn’t stop me from feeling giddy over the the ‘new’ness of it. 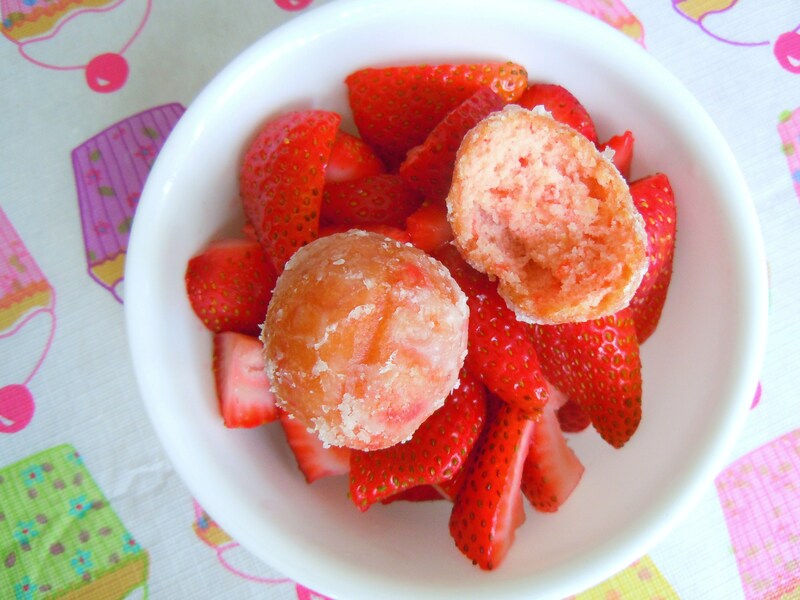 I was so excited to try Tim Hortons’ new strawberry glazed Timbits that I staged a mini photoshoot with them and posed them in a bowl of strawberries that I had just happened to have in the fridge. Seriously, the timing couldn’t be more impeccable. They’re so darn cute! And they taste so yummy. I would have taken photos of the birthday cake ones too but everyone in the house ate them before I could do anything so I’ll have to go out and get me a 10-pack of them one of these days so that I can get proper photos. They would look so stylish with my cupcake tablecloth background. 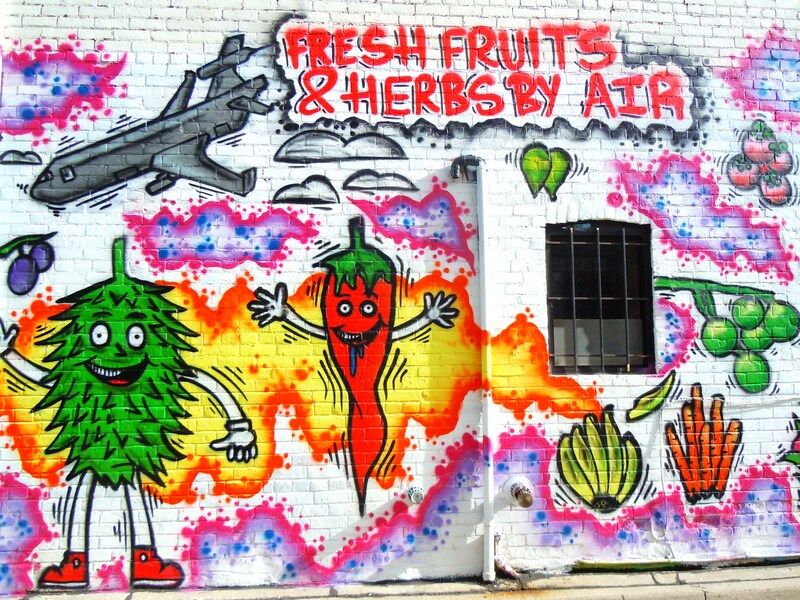 Okay, so I’m going to preface this post by saying that nothing here is edible, but I HAD to show you all these photos I took yesterday during my morning out on the Ossington strip: AWESOME FOOD-THEMED GRAFFITI ART!! 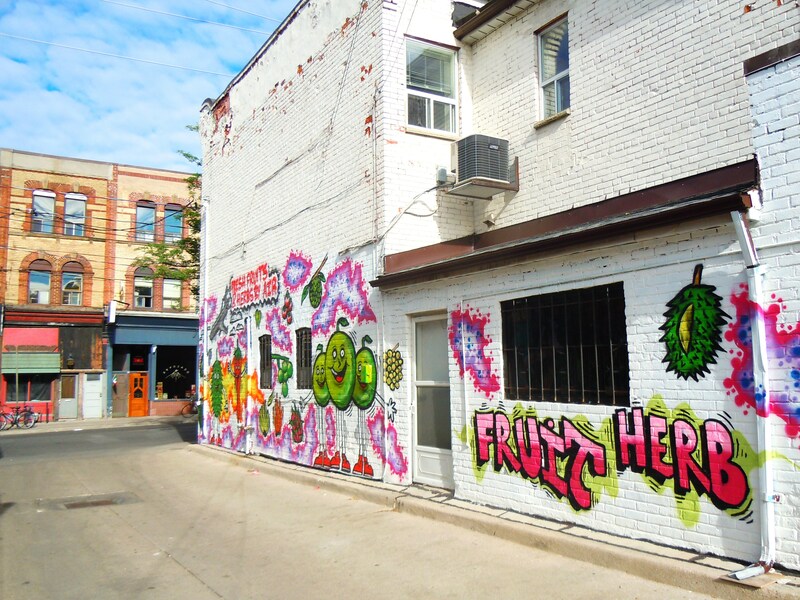 I found this entire spread on Ossington just north of Foxley, I believe, and I went nuts with the camera. Carrots! Bananas! Limes! 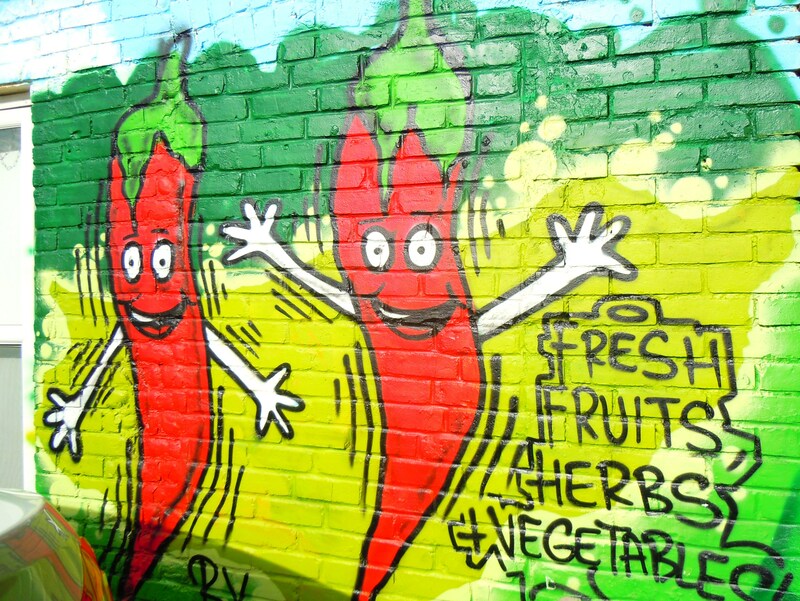 Chili peppers! Considering what a food mecca the Ossington strip has become in the past few years (on my to-eat list: Fishbar! 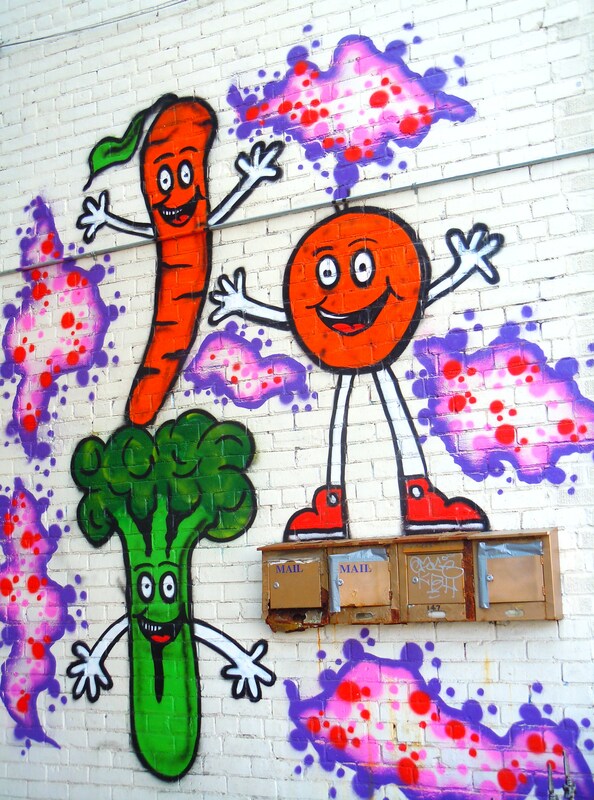 ), the presence of the food graffiti art is rather appropriate! 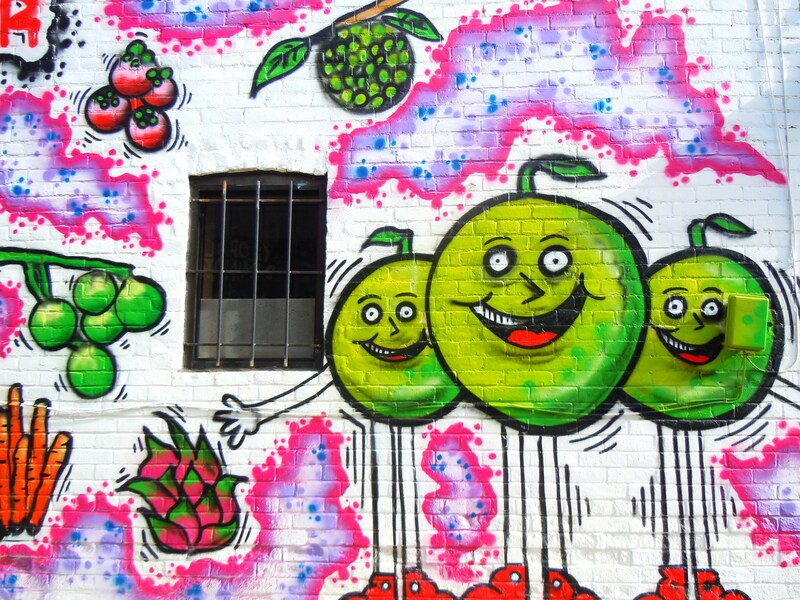 For those of you who don’t know, I LOVE taking photos of graffiti art in the city. Obviously I’m referring to the gorgeous stuff painted on the sides of buildings all over the city, not the vandalism form of it! That I don’t support. But the art? Can’t get enough of it. My boyfriend and I have been photographing these amazing works for over 5 years now and I’ve created quite a photo collection for myself, both on my computer and in a real photo album where I’ve chronicled a large portion of my shots. I’ve even organized my photos by neighbourhood so I can remember where I took them and, up until yesterday, I didn’t even THINK to create a separate set of just food-related ones. Duh, right?! New project in the works! 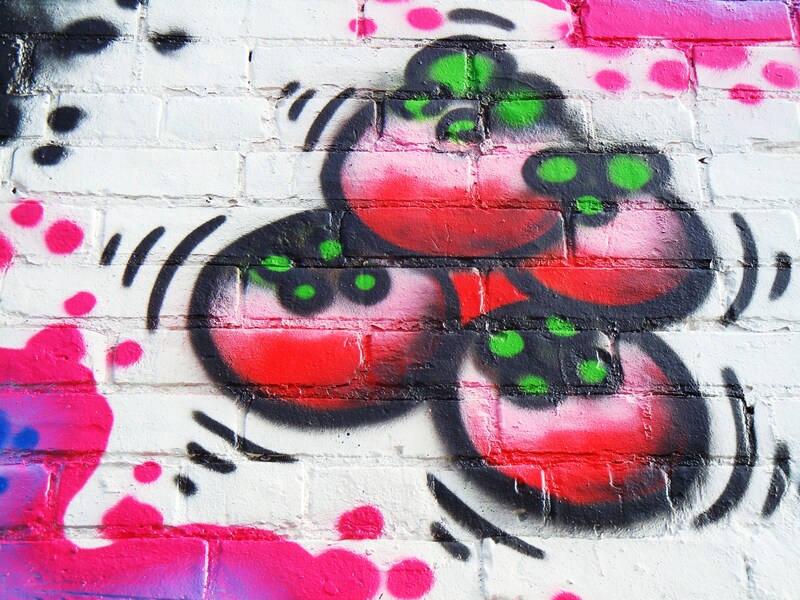 Being an artist myself, graffiti art ignites such a creative fire and passion in me and I really have my boyfriend to thank for fueling this passion in the beginning. 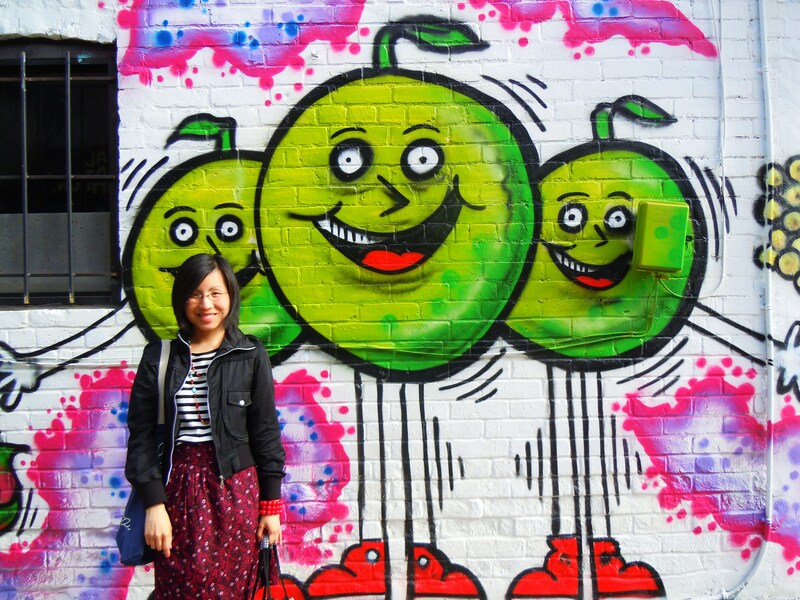 In addition to taking me to enjoy and photograph flowers on our first date, my boyfriend also took me to the side streets of both Queen West and Richmond to photograph all the graffiti art that was tucked away because he knew the art would make me so happy (quite the keeper, huh?). I couldn’t believe my eyes. So much colour, so much personality, so much talent. I’ve actually seen graffiti artists up close and in person doing their thing with the spray cans a few times and it is so inspiring just to watch them. It’s mesmerizing. These are talented folks who are hired by building owners and/or the city to create these artistic masterpieces for everyone else to enjoy and to juice up the visual landscape of the city. Seeing the focus and drive and artistic wittiness reflected in these works is a beautiful thing. I know, I know. It’s summer, not spring and we’re closing in on Canada Day, not Easter. So theoretically, I should be posting photos of an awesome summer haul, right? In theory, yes. But when you’re sipping tea left and right and trying your best to keep up with the dizzying array of delicious options available, you’re going to fall behind. 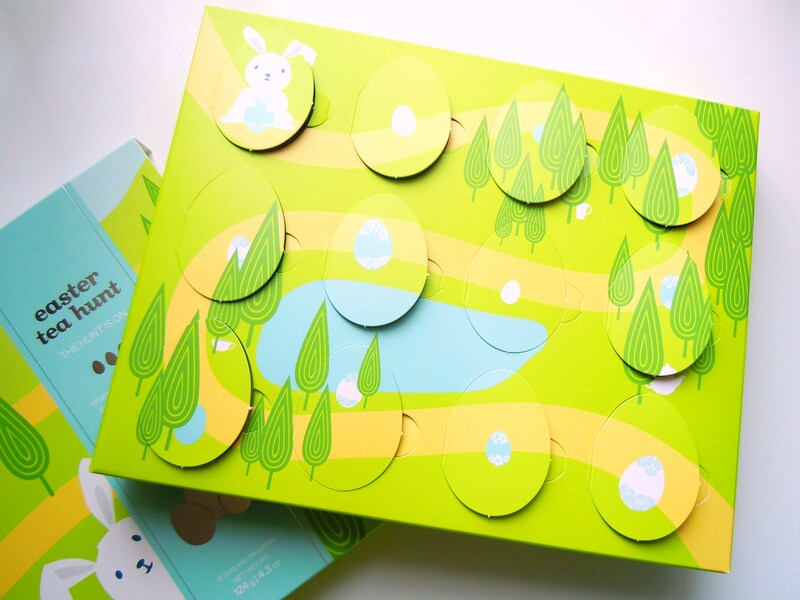 I’m still bummed about not exhausting the spring collection before it went off the shelves! So I’m playing a bit of catch-up right now with my sets. I FINALLY cracked this baby open (in my defense, it’s only been 2 months, not 2 years!) 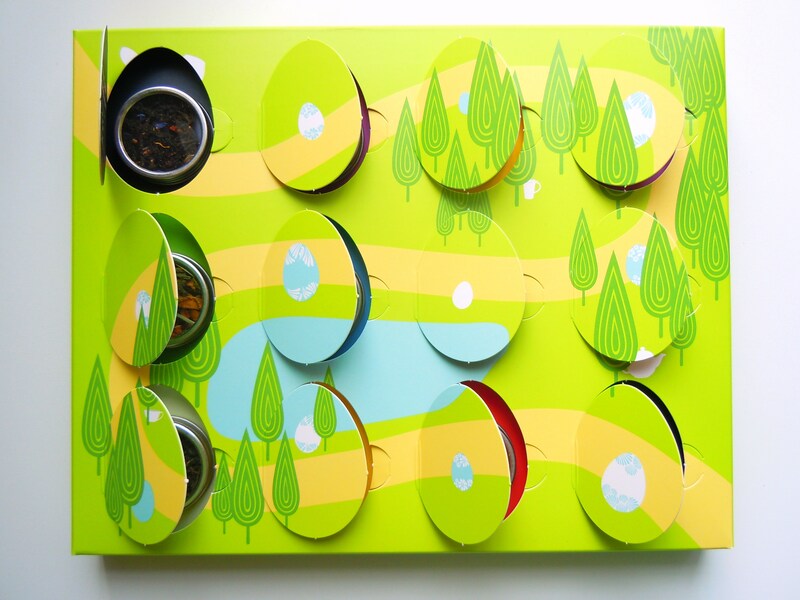 and played around with the adorable peek-a-boo egg-shaped flaps and tea tins in this cute-as-a-button 12-tea set which includes favourites such as Red Velvet Cake, Chocolate Macaroon, Strawberry Rhubarb Parfait, Lime Gelato, Chocolate Rocket and more. I wanted to try something different though so I decided to try the Happy Kombucha tea ($9.75 for 50g in-store and online), an Oolong with mango, pineapple, kombucha powder, and safflower and HOLY MOTHER OF PEARL is it ever fruity and refreshing and delicious! 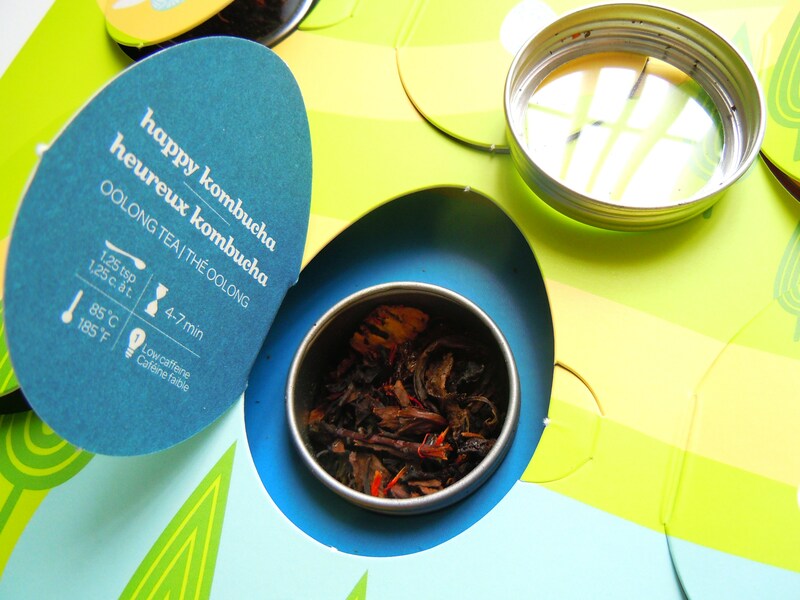 To me, it tastes similar to the Long Life Oolong but with more of a tropical twist to it as opposed to a peaches and cream and with a subtle sweet tea scent and flavour mixed in as well. Its looks are deceiving; in appearance it looks like a mix of rolled tea leaves with chili flakes and sundried tomatoes but in taste it is all brightness and fruitiness. I instantly loved it and it’s now on my list of favourites. I know what you’re thinking, you’re thinking, “well, you love everything!”. I actually don’t. 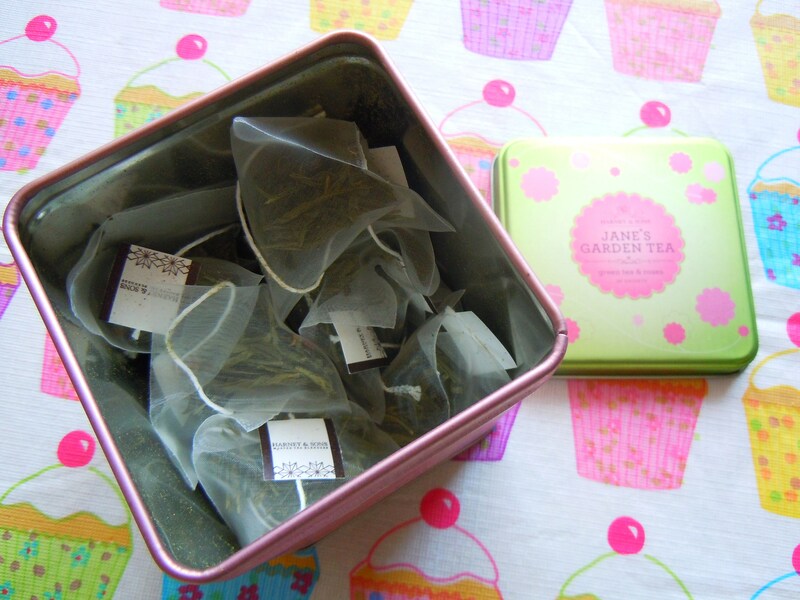 There are a bunch of teas I’ve tried that I don’t care for and that I wouldn’t buy or bother to drink again. I only post about the things I love because ranting or focusing on the things I don’t is a waste of my time and energy and it’s funner to talk about things I enjoy. So if any of you ever want to know which teas I’m not fond of, pop me a message and I’ll message you back privately with my honest opinion, no holds barred! 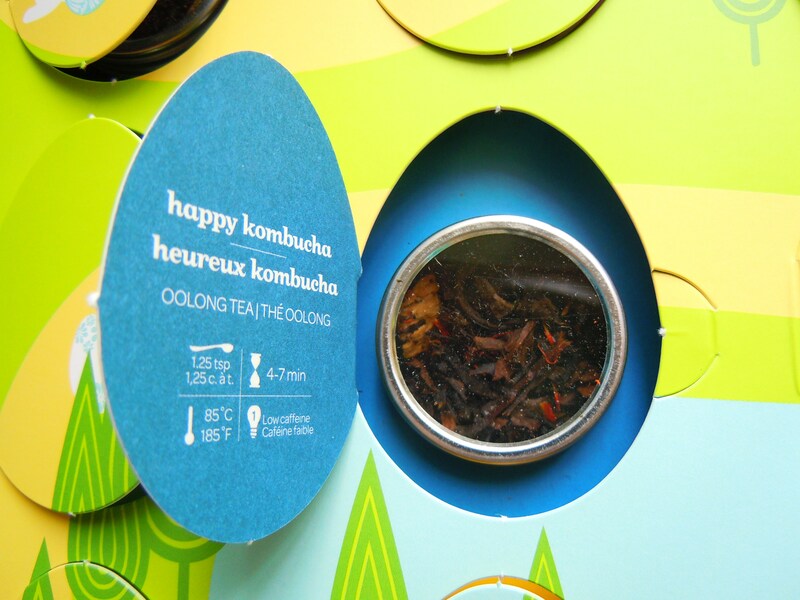 Lovey-doveyness aside, Happy Kombucha is truly where it’s at for a yummy summer iced tea option. It’s a fab tea and its name is fun to say! 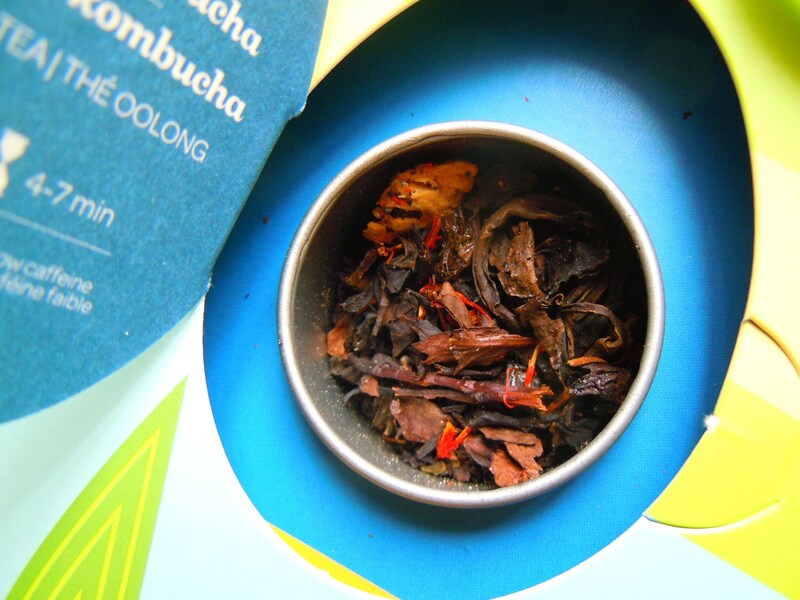 At first, I thought kombucha was just a fun name but I looked it up online and found out that it’s actually a type of tea that goes through a fermentation process with all sorts of probiotic and bacteria culture stuff going on. For more info on kombucha, check out this great blog called The Kitchn where Emma explains the food science behind it with great photos and descriptions. Drinking this amazing tea totally made my day. After finishing my special edition holiday gingerbread creme Oreos last week (I know, it takes me awhile. 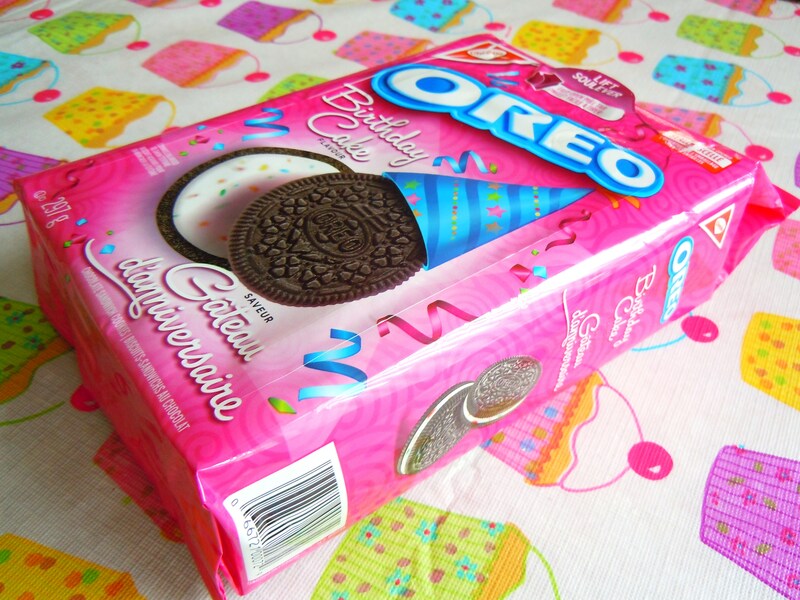 But in my defense, I’m the only one in the house who eats Oreos so I need to pace myself before I turn into a blimp! 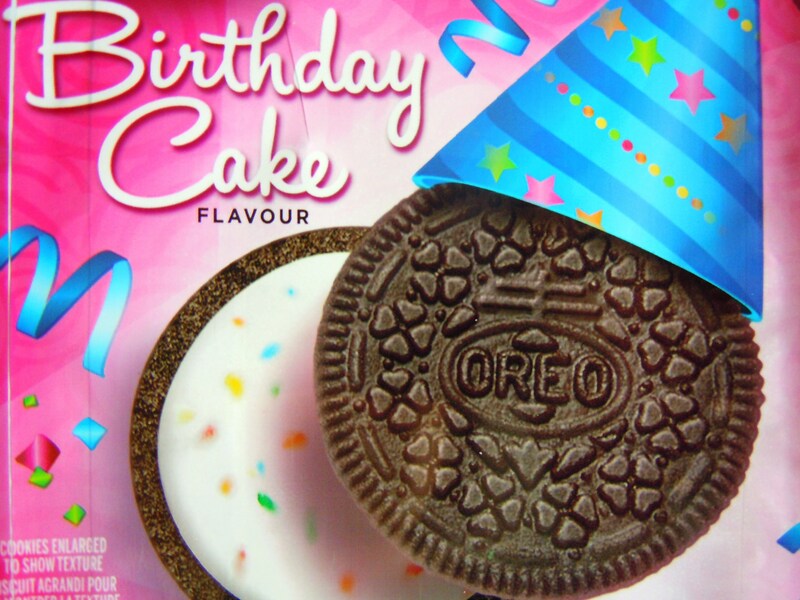 ), I cracked open a fresh pack of Oreos, also special edition, to slowly enjoy for the rest of the summer and most likely fall: Birthday Cake! 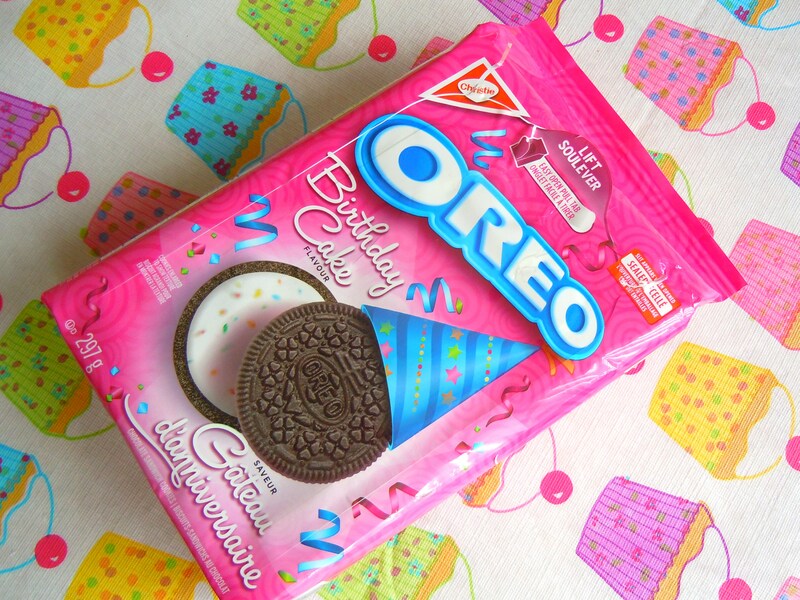 I must say, these ones are much tastier than the original batch of anniversary Oreos that came out back in 2012. 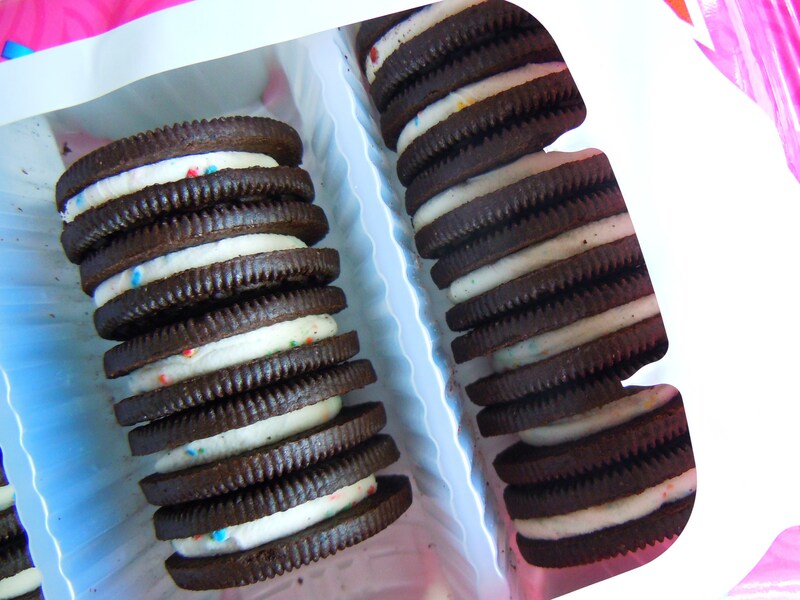 YUM and YAY for confetti and a new pack of Oreo cookies for the season! 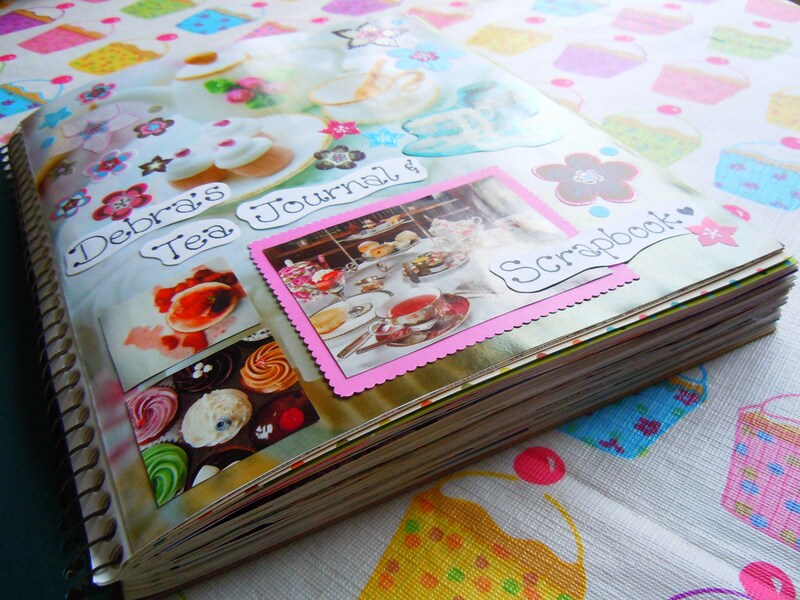 And that was the plan, to make scrapbooks that were uniquely our own, each telling our own special stories. While my best friend and other friend never ended up using it for this purpose (I know, I asked out of curiosity), I went to town with mine, creating a personal, visual time capsule using photos and magazine cut-outs and stickers and stationery to tell the story of what high school was like, what my life was like, and everything that embodied what I loved and who I was at that point in time. I poured myself into it, creating layouts of birthdays parties, prom, Christmas get-togethers, fun things that happened in high school. It became a pet project near and dear to my heart at the tender age of 18. I loved the notebook I used so much that I actually went back soon after to buy another one, this time with a dark teal cover. And it is this 2nd notebook that now houses my new and beloved Tea Journal and Scrapbook. Check out how THICK the scrapbook has gotten! The pages add up fast! 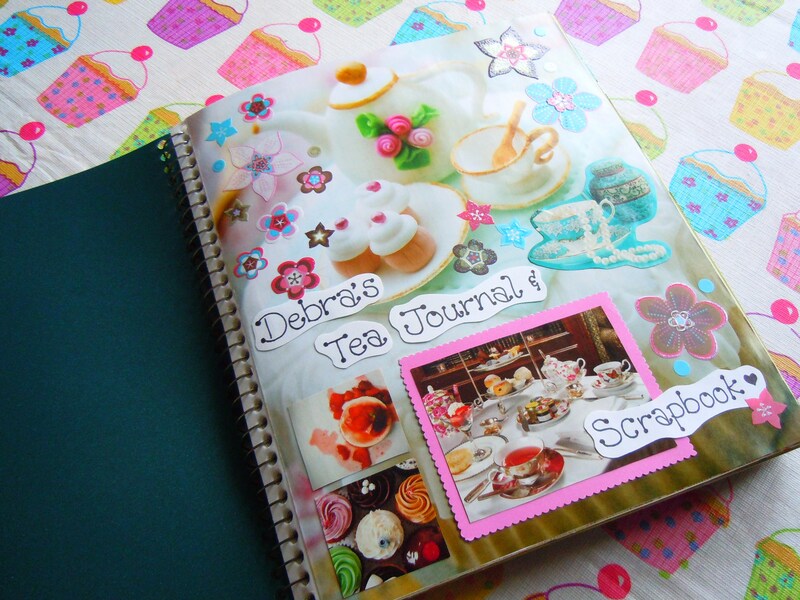 I know it’s a bit of a departure from my blog’s namesake (hi 8×8 scrapbooking! ), but I wanted to do something different and I wanted everything in one cohesive package. 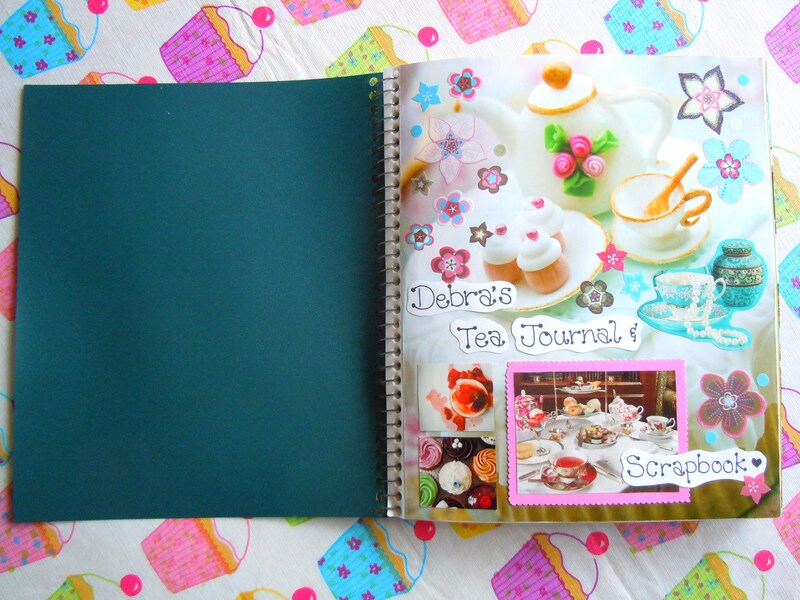 Working on my latest scrapbook project, my tea journal and scrapbook, has been one of the best things in my life for the past few months. It’s been so much fun and such an amazing creative outlet creating a gazillion layouts chronicling my afternoon tea adventures, teatime recipes from magazines, tea-inspired food, and my favourite teas and tea experiences. And just like that first Five Star notebook scrapbook, I poured my heart and soul into it. It’s a reflection of who I am (or at least part of who I am) and how deeply I have fallen in love with all things tea in the last 5 years. It’s been so much fun that in hindsight, I should have bought 5 more notebooks! I only have 5 more pages, front and back, left and still plenty of scrapbook layouts to do so I am on the hunt for another one (or three). 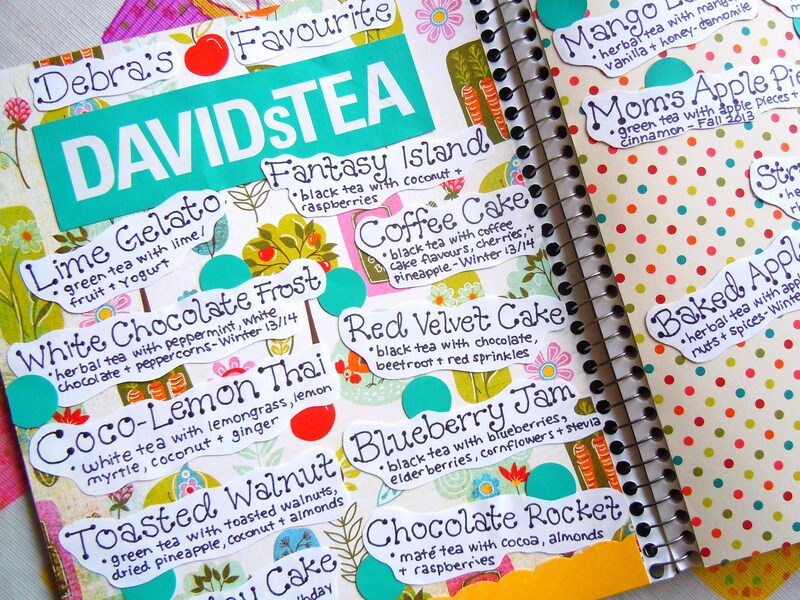 While I’ve plowed through a ton of photos and layouts, some pages are still a work in progress, but for good reason: these pages are growing lists of my favourite teas from different shops and brands! I had a jolly good time adding a few more favourites to my David’s Tea layout recently and creating the layout in general. I wanted it colourful and punchy so I used some bright and fun scrapbook paper that would stand out but at the same time be a good backdrop to plain white paper and text. 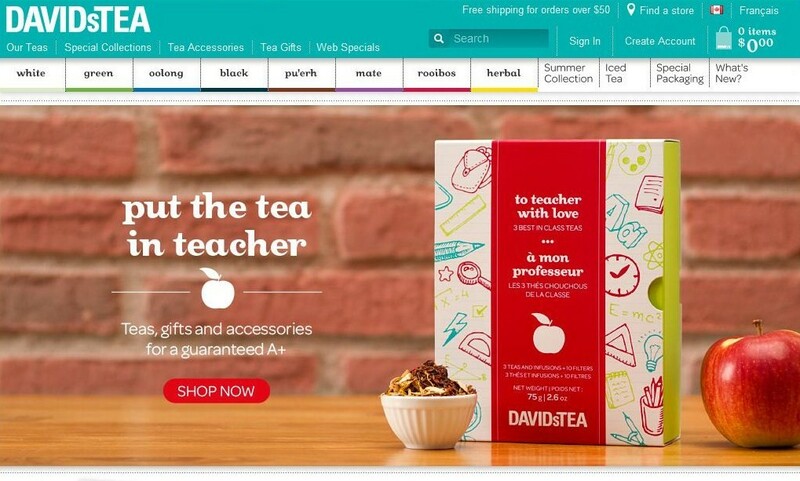 And to be resourceful, I punched out the teal circles and cut out the David’s Tea logo from an actual David’s Tea bag! 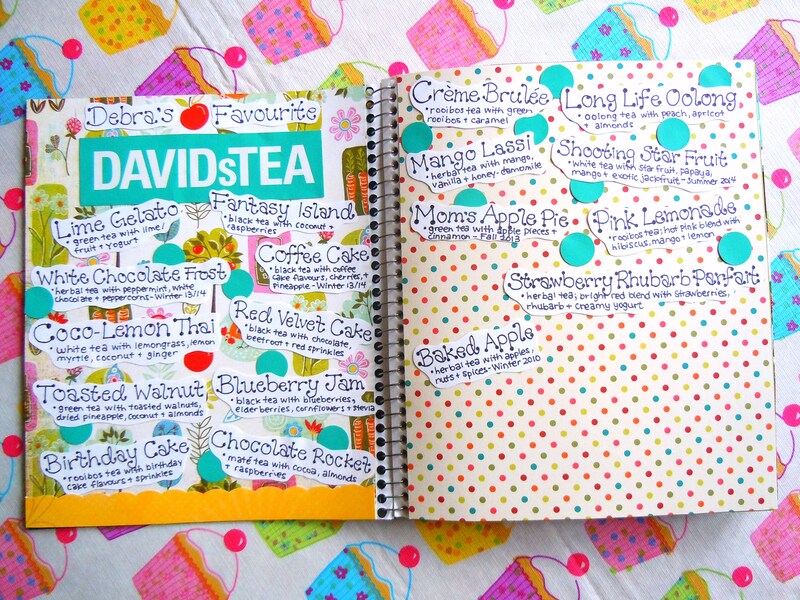 Here are some photos of my scrapbook cover page and David’s Tea scrapbook layout, as well as an updated list of my favourite teas! 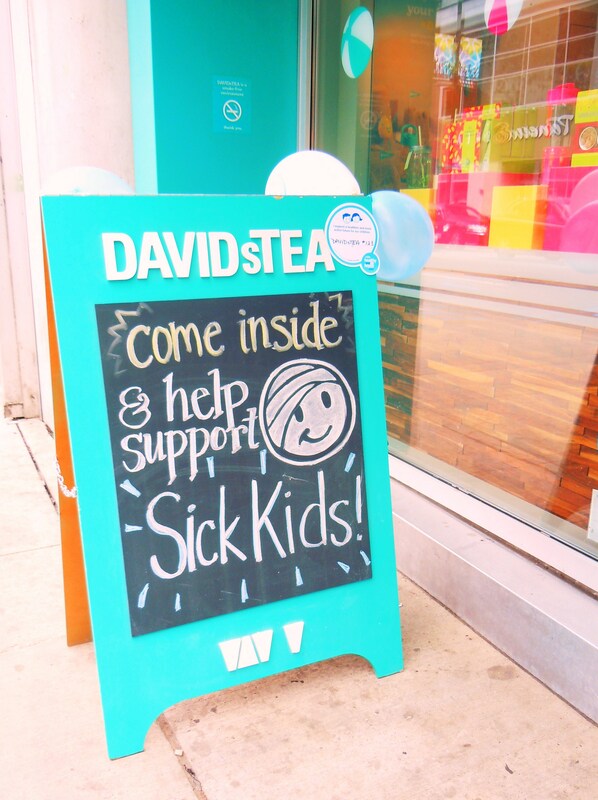 A recent Sick Kids Hospital & David’s Tea collab! I’m almost positive I’m in the minority on this one: I’ve never been a coffee drinker. Ever. While most people line up at Timmy’s or Starbucks or Second Cup for their morning java (or just make it themselves at home), I’m usually either noshing on a breakfast wrap or sipping on a cup of tea. Or both. Coffee just hasn’t captured my heart the way it has almost everybody else. Even so, I know how deeply folks (like my mum!) love their coffee and how the morning jolt or two is crucial to functioning for the rest of the day. And I’ve always found it amusing. I think I finally know what that feels like now – only with tea. I don’t feel right unless I get my weekend fix of David’s Tea. 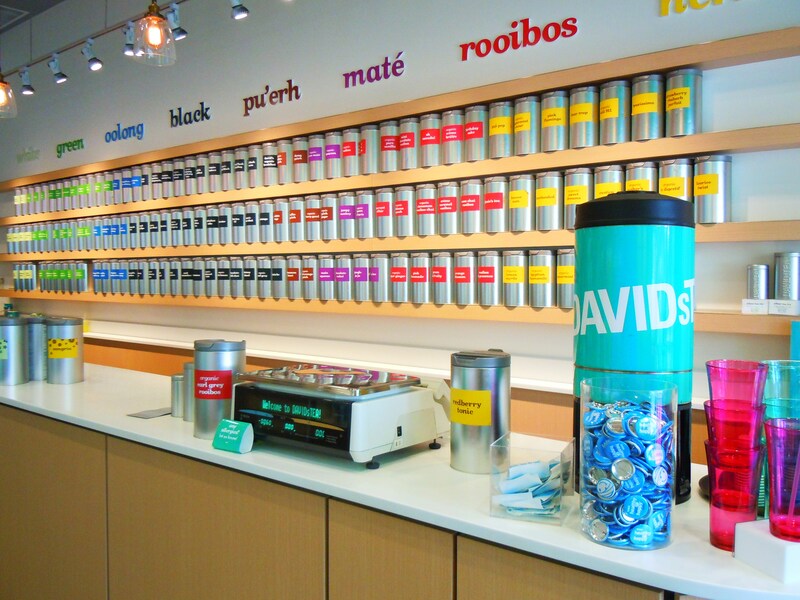 I make myself a cup of tea at home most days but on weekends I’m talking literally walking into a David’s Tea and getting myself a hot or iced cup of whatever flavour I happen to be craving at that particular moment. I am at odds with myself now if I go a weekend without a visit. Which is not to say I’ll start exhibiting symptoms of withdrawal like twitching if I don’t get my fix but I will certainly show signs of dissatisfaction like, you know, pouting. 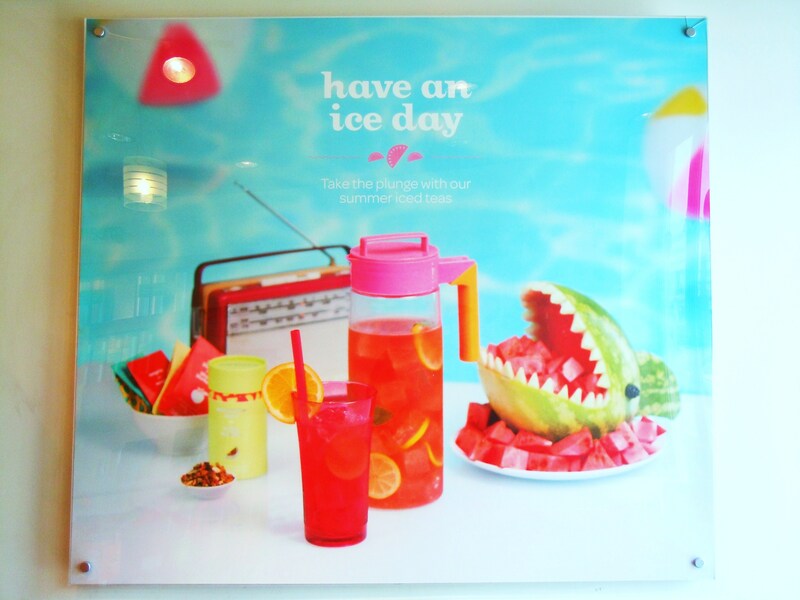 Going to David’s Tea is just too much fun – the window shopping (and of course real shopping when I do my hauls), the sampling, the adorable themes, sets and accessories, the cute chalkboard promos (see the Sick Kids one up top! This one was from two weeks ago) and the tea drinking. You should see my tea menu. So many scribbles and notes on all the teas I’ve drank so far, my favourites, my not-as-favourites, the teas I still need to try, the ones I’ve bought, possible ones my best friend would love, the ones my brother has tried and loved…yeah. It’s a scribbly mess and I love it. 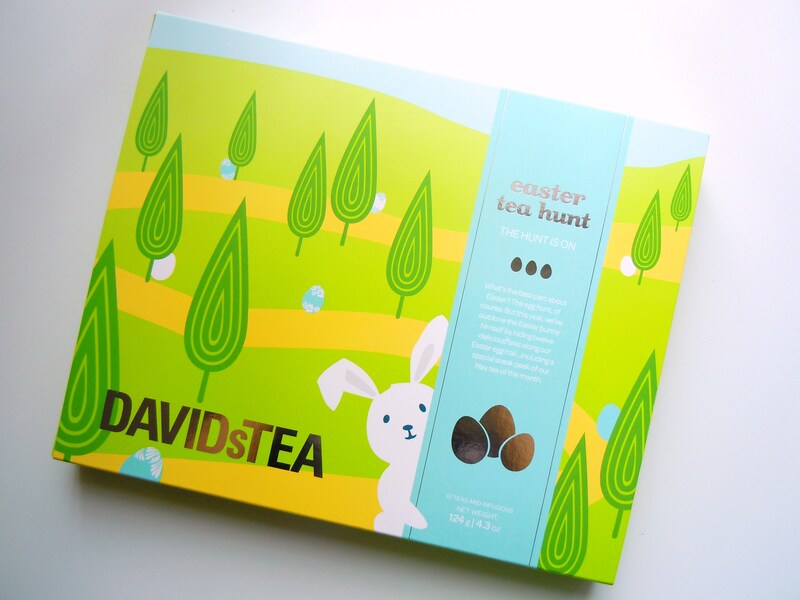 So, I’ve been making my weekend/weekly jaunt to David’s Tea and enjoying the lusciousness that is their summer collection. I am SO in love with this collection and I’ve actually been trying it out for a few weeks now, knocking them down one by one. 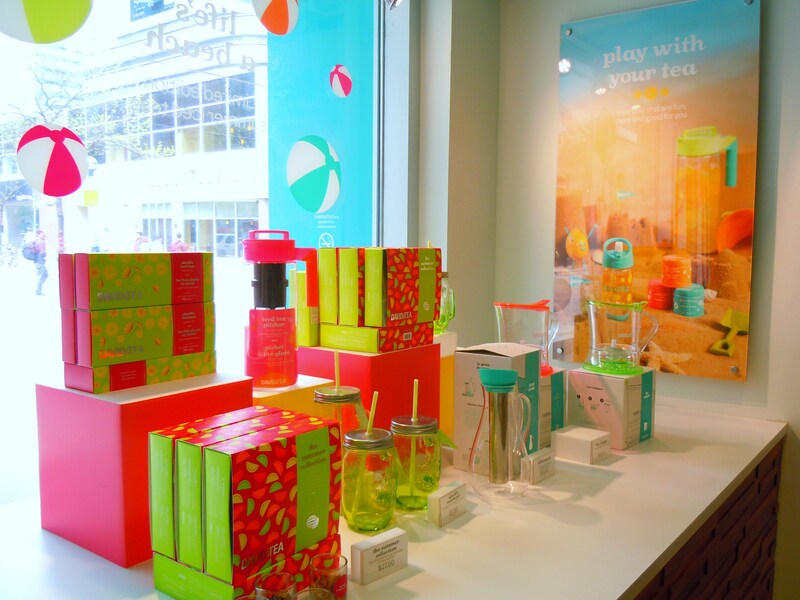 The summer packaging and accessories are so bright and punchy and fun (watermelons! pineapples! palm trees!) and the seasonal flavours are really great. I’ve tried 4 so far: Shooting Star Fruit, Just Peachy, Mango Fruit Punch and the June Flavour of the Month, Hot Tropic which I actually tried today (it tastes like a mango pina colada!) and my absolute fave is the Shooting Star Fruit with honourable nods and mentions for the Just Peachy and Hot Tropic for also being awesome. You’d think things would get boring for me making a visit once a week but they truly don’t because there are constantly new things being introduced and a slightly different selection to drool over based on the location. It’s insane. 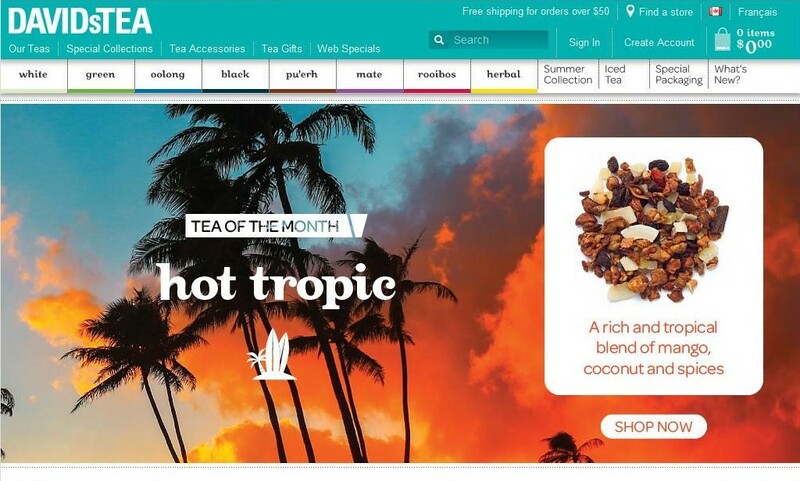 Along with the slew of new summer seasonal stuff (including the iced teas, pitchers, steepers, mugs, teapots and pitcher packs), there’s the June Flavour of the Month, tea flavoured chocolate bars, end-of-the-school-year teacher’s set, fun new tea blends, and even tea biscuits and cookies by the box! I absolutely cannot wait until I make my actual summertime haul of goodies. Until then I’ll be happily drinking, scribbling, and scrapbooking away. 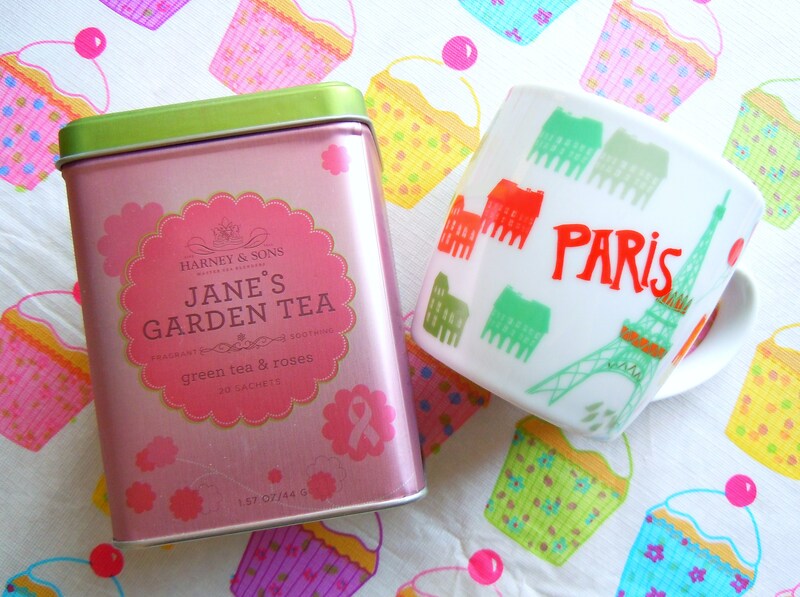 One of my new favourite things: rose green tea and cherry rose green tea! For the past half year, I have fallen head over heels in love with rose green tea and cherry rose green tea, ordering a pot of it during afternoon tea and trying out different brands from different cafes. I never thought I’d enjoy a tea with floral notes to it, not because I dislike floral scents or flavours but simply because it’s never grabbed my attention in the past. 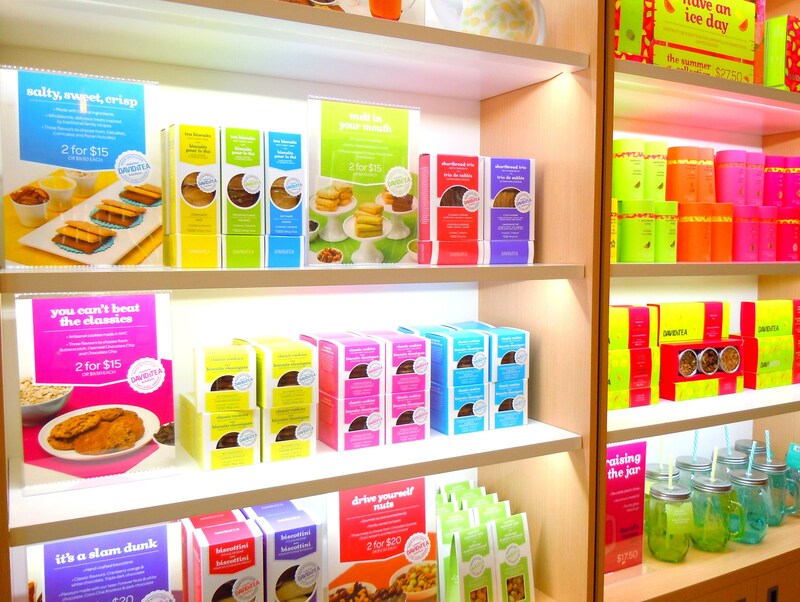 I’m pretty open to desserts flavoured with rosewater and lavender and I love all different kinds of tea but my tastes tend to lean more toward dessert flavours, tropical and citrus flavours, and plain jane green and milk oolong teas so floral teas have never really been on my radar – until now. 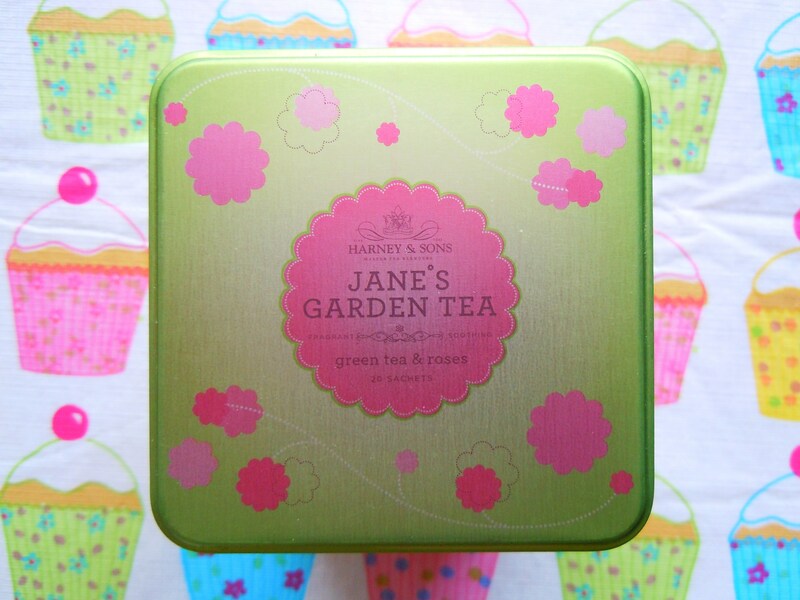 One of my favourites is Harney & Sons’ Jane’s Garden Tea, a beautiful, aromatic, light and refreshing tasting green tea with rose petals. It smells so nice and the tea steeps into this gorgeous shade of light grass green (which I promise I’ll post a photo of when I steep another cup! 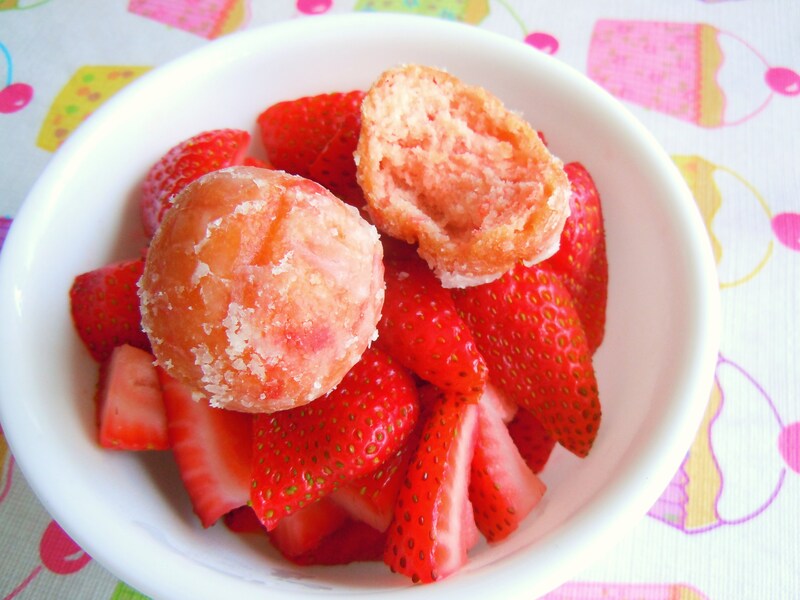 ), making it a great choice for spring and summer both in appearance and in taste. The floral notes are subtle (meaning not too overpowering or perfumey) yet prominent enough to stand out as its own flavour distinctly separate from the green tea. 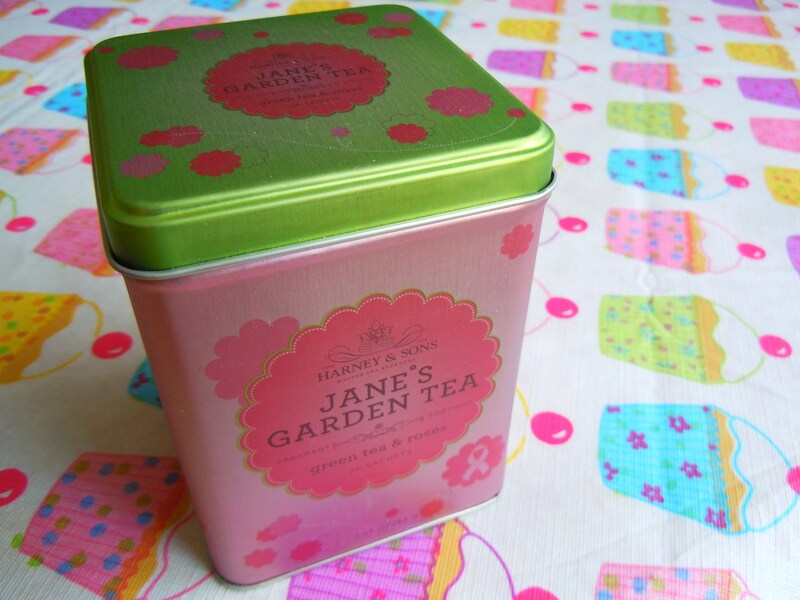 And best of all, the tea benefits the National Breast Cancer Foundation, honouring Jane Llyod, a family friend of the Harneys. For those who are wondering how I got my hands on a tin, I placed an order online on Harney & Sons website (https://www.harney.com/). They ship to Canada and have different flat rate shipping brackets based on how much you spend. Subscribe to their e-mails because they consistently send out great promotions year-round. I took advantage of an amazing sale last year (I believe it was 30% all teas) and basically celebrated Christmas in August when my package came in the mail! I know we can buy Harney & Sons at Indigo and Blue Banana in Kensington Market but if you’re looking for the endless selection, take a gander at the official website. I’ll admit, it’s a dangerous thing to do, but for the quality, variety, and gorgeous tins, it’s totally worth it.